This sofa table is so cozy and so versatile. The clever drop front drawer allows you to store a media player, or you can flip open the top of the table to convert it to an instant desk. 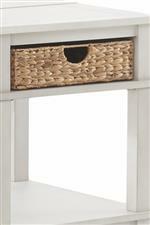 It boasts reeded drawer fronts and two removable storage baskets. The Chambers Casual Sofa Table with Storage Baskets Converts to Desk by Klaussner International at Beck's Furniture in the Sacramento, Rancho Cordova, Roseville, California area. Product availability may vary. Contact us for the most current availability on this product. Storage Three shelves and two removable storage baskets. Flip top and drop-front drawer converts table to desk. Ask more from your furniture. Every table in this collection acts as handy storage solution as well as a cozy decorative accent. This group is packed with clever conveniences like included storage baskets, pull-out shelves, and drop front drawers. 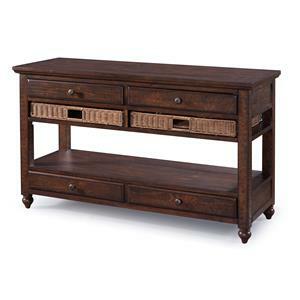 Make your living room that much more livable with these phenomenal accent tables. The Chambers collection is a great option if you are looking for Casual furniture in the Sacramento, Rancho Cordova, Roseville, California area. Browse other items in the Chambers collection from Beck's Furniture in the Sacramento, Rancho Cordova, Roseville, California area.